Years ago, the X-15 was an experimental aircraft for testing futuristic supersonic and hypersonic space plane concepts such as the space shuttle orbiter. X-15: In the top picture M=3.5. The Mach number is 6.0 in the picture at the bottom. The following link has a very interesting article on the X-15 aerodynamics: http://history.nasa.gov/SP-60/ch-5.html. If you are interested in developing airplane concepts, NASA OpenVSP is a good option. More information can be found at http://www.openvsp.org. 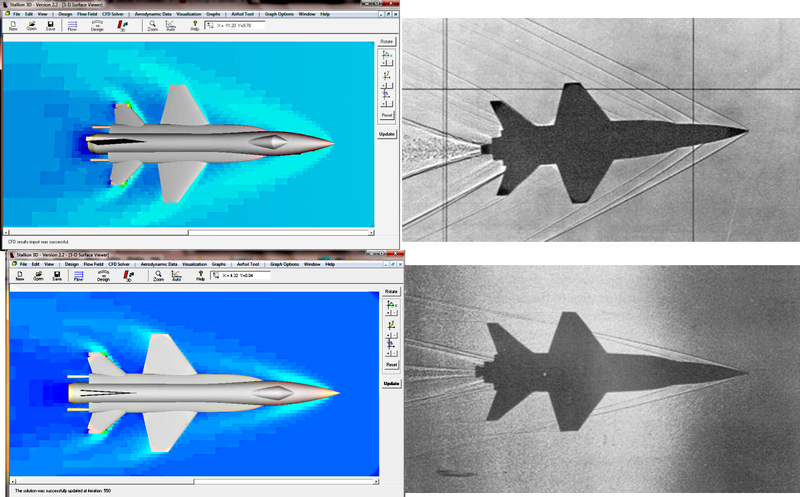 The .stl output of OpenVSP can be read directly in Stallion 3D for rapid aerodynamics analysis (no external grid generation). More information can be found at http://www.hanleyinnovations.com. Do not hesitate to email or telephone me at (352) 240-3658 if you have any questions. Thanks for reading.